Spring dresses are my absolute favorite. After a long winter they just seem so fresh and I’m always excited to wear them when the weather permits. I got this one last week and couldn’t wait to put it on…. but that may be because most days I’m in workout clothes now #momlife. My lace/crochet obsession has officially crossed over to spring and it won’t be stopping anytime soon. This dress is a little different, I love the shape and obviously the color. Is it a surprise that pink is one of my favorite colors? TGIF! Was it just me or was this week a little too long for your liking? I’m excited for a spring weekend at home and Easter with my family. When I’m shopping for myself I prefer to do it online. It’s so much easier and organized. I spend so much time in stores for work and get a little burnt out. 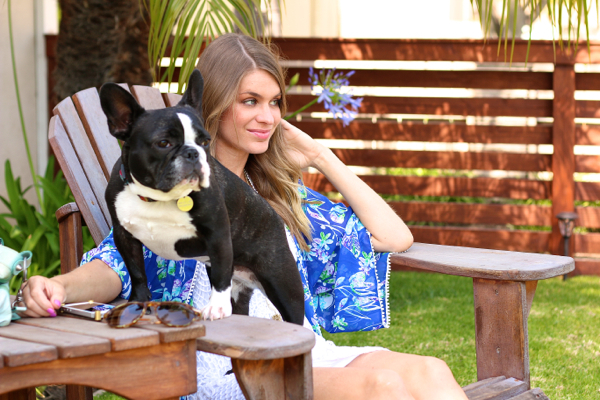 One of my favorites sites is Revolve. I find myself always making a wish list and decided to share my current one. No surprises here it’s comprised of lace dresses, off the shoulder tops and pom pom sandals. Happy Friday… and it’s a good one! I’m really into off the shoulder dresses and tops, they’re the perfect alternative to strapless and are much more flattering. They always make me feel very boho and who doesn’t love that. This dress is the perfect new addition to my wardrobe. It could just as easily be dressed up with a pair of strappy heels and a clutch, which is how I plan on wearing it next time. 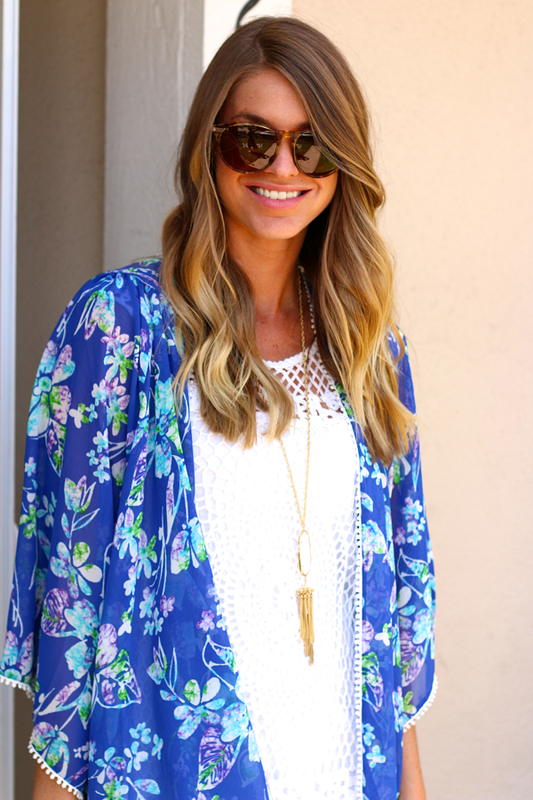 I’ve always loved flowy, silk kimonos so when I spotted this one last week it was a no brainer purchase. I wore this on Easter over crochet and felt really 70’s boho. This dress was a great find a few years back in the kids section of all places! White dresses are a fixture in my closet… you can’t really get more versatile than that. Hope you all had a great Easter if you celebrate. Here’s what I wore yesterday for brunch at my parents house and then an egg decorating party. 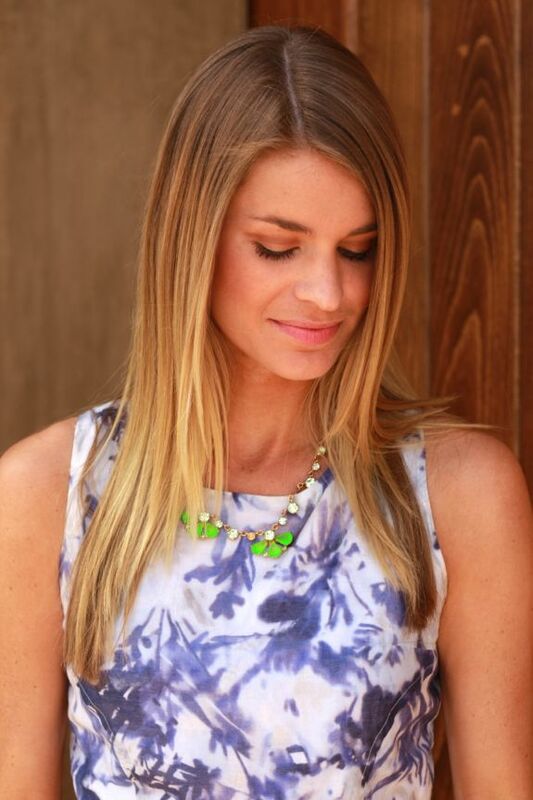 I love adding fun pops of color, in this case neon, to simpler pieces like this dress. My new denim jacket was the perfect layer to add as the day went on and I got cold, I know I will be wearing it to the ground this spring/summer.